Cook bacon until it’s cooked through but not crispy. The easiest way to do this is to bake the bacon at 350°F for 8-10 minutes until it’s just cooked. You can also use a skillet, but watch it closely and try to keep the strips straight. Whisk eggs together in a medium dish large enough to hold a strip of bacon without bending it. Open the bag of chips and smash the chips with a rolling pin or mallet until they’re in fine pieces. Pour crushed chips onto a plate. When bacon is cooked, let it cool and then dip each strip in the beaten eggs and coat well. Then press the strips down on the crushed chips on both sides to coat them really well. Heat oil in a large cast iron skillet until it reaches about 325°F. Careful: If the oil gets too hot, the strips will burn. When oil is hot and strips are coated, gently fry a few strips at a time for about 45-50 seconds per side until they’re crispy but not too browned. Remove bacon from skillet and let drain on paper towels. Serve chip-crusted bacon with dipping sauces while warm! If you have a deep-fryer, feel free to use it. Just dunk the chip-coated bacon strips into the pre-heated deep-fryer for about a minute until they’re nicely browned. Bacon is crusted in crushed chips and then fried to a crispy crunch. I used to go to a happy hour at a local watering hole where one of the most popular appetizers was just a bucket of bacon. It actually came in a bucket and was just as simple and delicious as it sounds. The key, of course, is that the bacon is very crispy. In an effort to make the strips a bit heartier (and crispier), I coated them with a layer of chips and lightly fried them until golden brown. 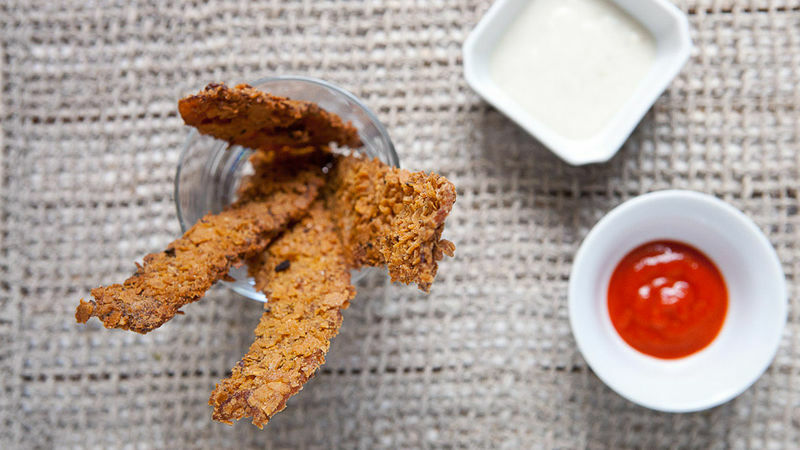 Bring me a bucket of these chip-crusted bacon strips any time! The key to making this recipe work is to actually cook the bacon first, but you don’t want it to be completely crispy. If you cook it too much to start, then it will burn when you fry it later. See those darker pieces above? While I would generally shoot for that level of crispiness on my bacon, that’s way too cooked for this recipe. You want the lighter version. If you’re baking your bacon at 350ºF (which I recommend), you’ll want to bake it for around 10 minutes to get it to the cooked, but not crispy, stage. I used plain Food Should Taste Good corn chips for my version, but you should absolutely change it up to suit your tastes. They have a huge assortment of chip flavors. You could probably use any of them! Use a mallet or a rolling pin to really crush these chips into small bits. Then just whisk up a few eggs in a large dish. Once the eggs are whisked together, dunk the cooked bacon into the eggs to coat each strip well. Then press the bacon into the crushed chips until each strip is really well coated. To cook, heat a few cups of oil in a large skillet until it’s about 325ºF. You don’t want it too hot or it will burn the bacon. Fry the bacon for about 45 seconds per side until the strips are lightly browned. Then let them drain on a few paper towels so they stay nice and crispy. I like to serve these guys with lots of ranch dressing and sriracha sauce. They're a perfect appetizer or snack! Nick believes that crispy bacon is the best thing. Check out his blog, Macheesmo, and follow him on his Tablespoon Profile.